It cannot be refuted that Jean-Auguste-Dominique Ingres was an artist who received mixed reviews throughout his career. He was an artist the critics loved to hate who fortunately attained definitive love during his later years. Ingres was, of course, influential nonetheless and a leader in the Neoclassical movement and he inspired many great artists included Picasso and Matisse. 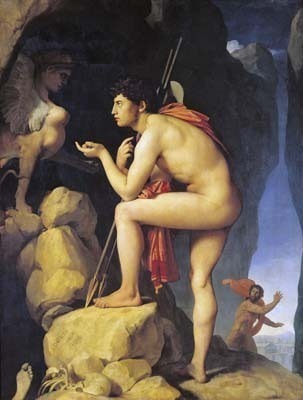 Born in Montauban, France, on August 29 1780, Ingres was introduced to art at an early age. Though his father was a mediocre artist (described as a 'jack-of-all-trades') he passed his love of art onto his more talented son. It wasn't long before Ingres elevated from his father's informal training onto better things. During the French Revolution however, Ingres's proper education at the school of Brothers of Christian Doctrine (today known as Confraternity of Christian Doctrine - CCD) was cut short by the abolition of religious orders in France in 1791. As a result, Ingres transferred to a fine arts academy in Toulouse. Aged 17, Ingres moved to Paris to study at David's studio. His training with the most celebrated artists and his later education from École des Beaux-Art awarded him the Prix de Rome, a scholarship given by the French government to study at the Académie de France in Rome (Académie de France à Rome). The Envoys of Agamemnon earned him the coveted position. At just 19-years-old, it was clear the young artist had an extensive knowledge of art history and a certain attraction to the technicalities of antiquity. Yet again, Ingres' education was impeded, this time because the French treasury, drained by the Napoleon Wars, could not fund his studies. During the time he was stuck in Paris, Ingres began his careen as a portraitist. 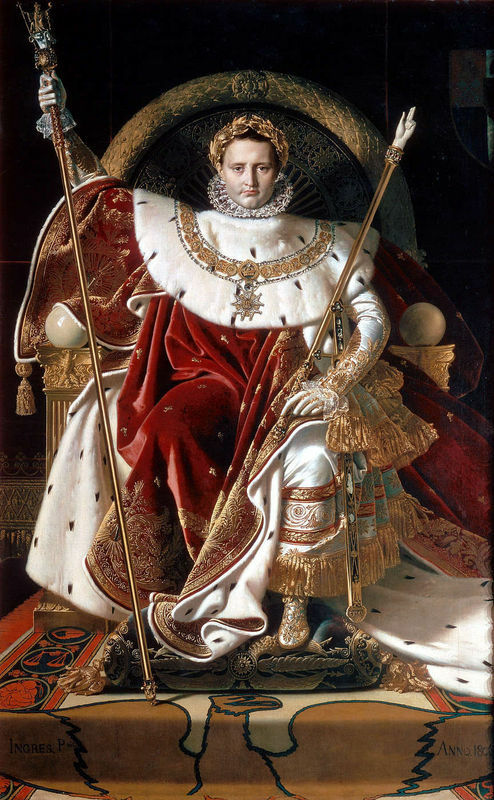 In 1806 he submitted his Napoleon on His Imperial Throne in the Salon. It proved a controversial piece. Critics commented on the stiffness and the flatness of his figures claiming his "primitive" style was gothic. Shortly afterward Ingres was able to go to Italy, where he would follow his own artistic impulses. He sent his works back to the officials at the École in Paris. Again, his work was heavily criticized for their dislike of his linear severity of Valpincon Bather and Oedipus and the Sphinx. They opposed his modeling (or lack thereof) and anatomical distortions of his figures in Jupiter and Thetis. The desire to stay in Italy after his scholarship ended in 1810 prompted Ingres to earn a living once again as a portraitist, this time of Napoleonic officials and dignitaries. Sometimes he was commissioned in the genre of history paintings which he much preferred. Whatever prosperity he had acquired disappeared in 1815 with the fall of the Napoleon Empire. Though he despised such commissions, Ingres's portraits are among his most admired work. He had a particular talent posing the sitters and captivating the personality with a photographic quality. Ingres eventually distinguished himself as a master of the "troubadour" genre, fancying himself to paint Medieval and Renaissance subjects in the artistic likeness of each prospective period. An example of his work during this time is Paolo and Francesca which features two ill-fated lovers from Dante's Inferno. He echoed the simplification and idealized figures of 14th century Italian paintings. Again, upon submitting to the 1819 Salon, critics attacked his work with claims that Ingres purposely took art back to its infancy. Also exhibited into the same Salon was La Grande Odalisque. Although it would later become a most celebrated canvas, critics of the day were outraged by it's presence in the Salon. Once again Ingres' subtle modeling was attacked. His perverse desires for distorted anatomy, as seen by the elongation of her back made her an unknown creature. At the age of 40 Ingres finally caught a break as he gained positive recognition as a religious painter. In 1820, he moved from Tome to Florence and adapted to the evolution of a more conventional, classical style, much like his hero Raphael. 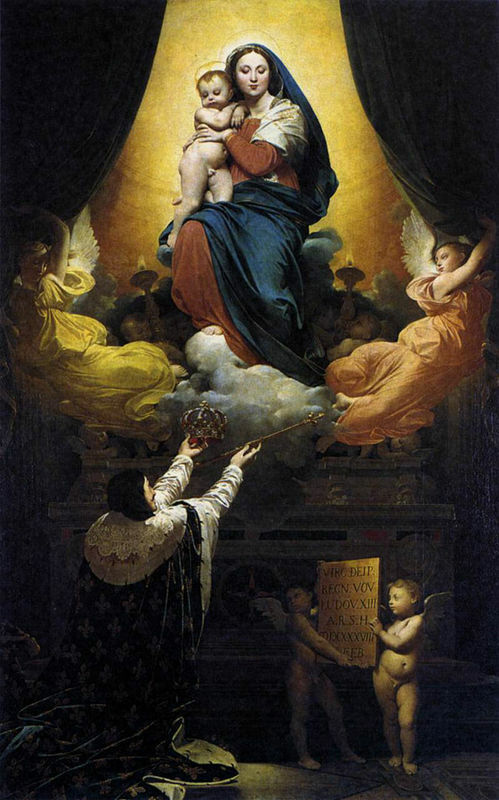 At the 1824 Salon, Ingres gained critical praise for The Vow of Louis XIII displaying the union of church and state. He was also elected to the Académie des Beaux-Arts. In 1829, Ingres became a professor at the École des Beaux-Arts and four years later he was elected to be President for the following year. Before that happened however, Ingres was accused of imposing his personal style on the entire school. Such heavy charges were not forgotten. At the 1834 Salon Ingres' Martyrdom of Saint-Symphorien. The religious piece was violently attacked by all, even Ingres' critical allies. Ingres vowed this to be his last exhibit at the Salon. That same year he left Paris for Rome again to direct at the Académie de France. During his six years at the Académie, Ingres continued to paint his own works. 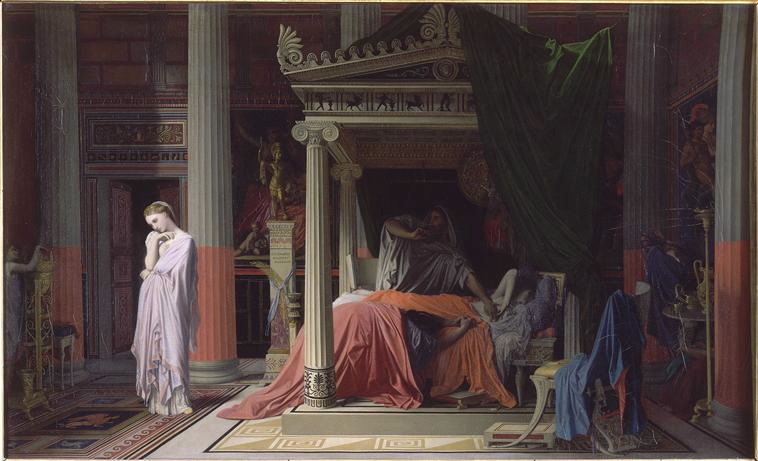 The response from Antiochus and Stratonice was once again in Ingres' favor. In 1841 he returned yet again to Paris triumphant, even dining with the King. * The French government elevated Ingres to the rank of Grand Officers of the Legion of Honor. He was the first literary/artistic figure to receive such a title. * He was also one of the first professional painters appointed to the Senate in 1862. In his 60s Ingres was recognized as the greatest living artist in France. Though a history painter, his major commissions were for portraits. As the most sought-after portraitist, Ingres captured the splendor of the feminine elite. Abstaining from entering the Salon for more than two decades, Ingres entered 69 pieces to the 1855 Universal Exposition in Paris. The reviews were mixed; to the Conservatives, Ingres was the last great representative of "the grand tradition": to the Progressives, his style was old fashioned and irrelevant to contemporary advances in painting. Continuing to paint into his latter years proved beneficial for Ingres. It was then that he completed his most notable works; female nudes. His two most recognizable works, La Source and The Turkish Bath are contrasting to the most severe degree. 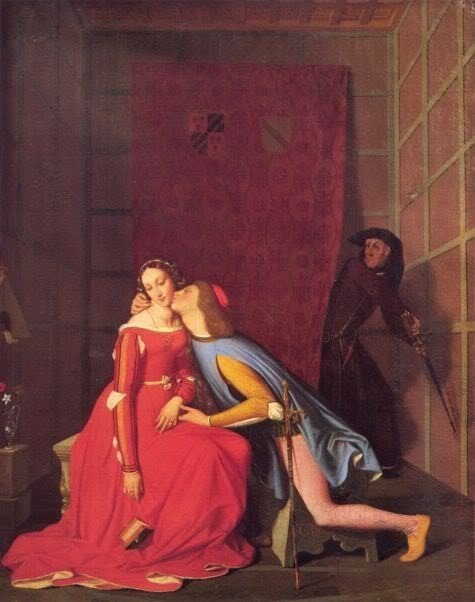 Ingres was married for 36 years to his love, Madeline. The birth of a still-born baby left them without children. She died in 1849 and he survived her by several years. He continued to paint for the remainder of his widower years up until his death in 1867. He died rich, honored and revered as a god by many of his pupils. 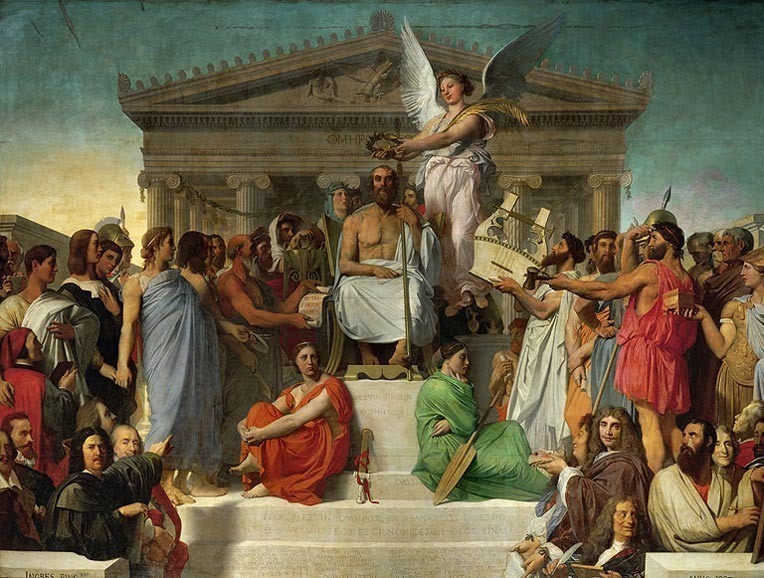 Ingres left a great impact on the artistic world as a true Neoclassical artists, inspiring some of the most influential painters who succeeded him.